Usually, Matt is the chili maker at Chez Good Appetite. He never uses a recipe & is constantly changing up the meat & beans but, always comes up with a great result. This time though I decided to take a stab at chili myself & I have to say the results were darn tasty! I'd made chili in the past with butternut squash it in but, was disappointed that the squash favor was overpowered by the other ingredients. This time I tried something different & roasted the squash separately, adding it to the chili at the end. Plus, I coated the squash cubes in a little maple syrup before roasting them to add some sweetness. This was totally the ticket! The squash retained its own squashy flavor which is perfect with chili seasonings. The biggest surprise to me was how much we liked the sweetness of the maple syrup & apple cider in the chili & how it played against the spiciness of the jalapenos & cayenne. Sweet & spicy chili is definitely something we'll be experimenting with again. Simmer the dried beans in 3 1/2 c water in a covered saucepan until tender, about 2 hours. Set aside. Do not drain. Preheat the oven to 400 F. Mix the butternut squash & maple syrup together in a small roasting pan. Roast in the oven until tender, about 25 - 30 minutes. Meanwhile, heat the oil in a large heave pot over medium-high heat. Add the bison & cook through. Stir in the onion, garlic & jalapenos. Cook until the onion is translucent. Add the salt, oregano, cumin & cayenne then cook while stirring for a minute. Add the beans including the cooking liquid, tomatoes including juice & apple cider. Bring to a simmer. Let simmer until thickened, about 1/2 hour. Add the roasted butternut squash & serve with sour cream & hot sauce is desired. Makes 5 - 6 servings. I love chili season. And while this might get me a severe scolding in parts of Texas, this sounds like a great twist on chili recipes. I'll have to earmark for one of the soon-to-be-here winter days in Nebraska. Oh--LOVE the squash, maple and cider in here! This is perfect chili for Autumn. Sounds wonderfully flavored! Great flavors in a tasty looking dish!!! I've become a big fan of butternut squash in spicy foods and this sounds like another combination I'll have to try! Hmmm, nothing like a good bowl of chili. I definitely would love to try this. I have been on a buffalo kick in this kitchen too. Buffalo Lasagna, Buffalo Taco meat, Buffalo steaks....yum! Looks lovely! 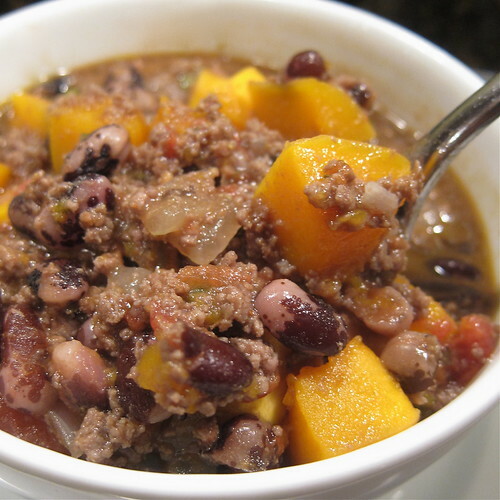 I love the combination of butternut and black beans - the bison is the icing on the cake! I don't think I've ever had butternut squash in chili, but it sounds like a perfect addition. i've seen squash show up in chili recipes a few times now and i think it's a really good idea--it's a nice and meaty veg. i love the maple in this batch, too! What a great idea! I will have a go at this one.